I wrote ‘Suzaku’. It means Vermilion Bird in English. It is one of the four gods said to rule over the four directions in China. ‘Suzaku’ preside over the south, the summer and the sea or the lake or the open ground. It is the mixed form of the peacock and the pheasant. 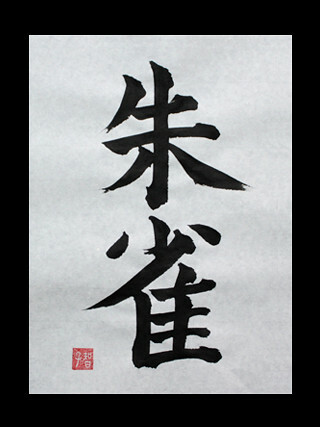 Often ‘Suzaku’ appears in Japanese Managa and it is used in the names of the place, characters or others.